Lake Effect's Mitch Teich interviews writer Kurt Chandler about Voces de la Frontera's founder Christine Neumann-Ortiz. The future of immigration reform at the federal level remains in doubt, stalled in the House of Representatives, where key Republican leaders oppose the package backed by the Senate. Palermo's workers on strike protest on May Day. 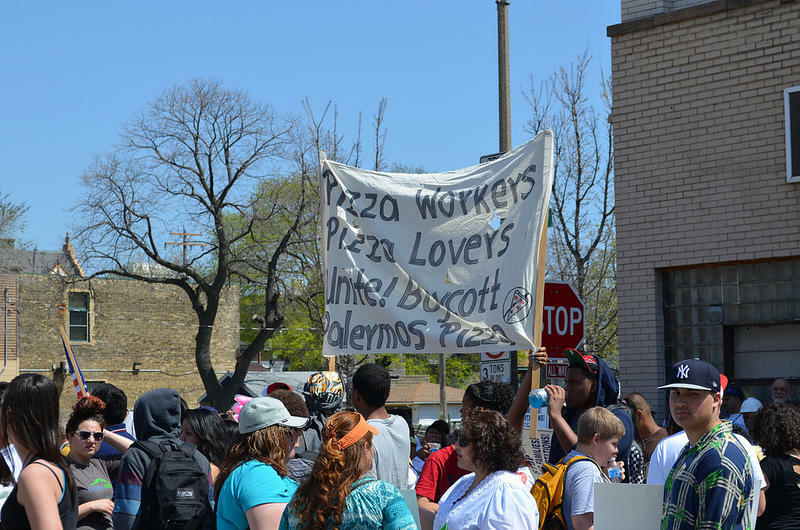 In Milwaukee, the issue of immigration is often linked to other issues such as the labor movement – a nexus at work in the labor unrest at Palermo’s Pizza, in which some workers sought to organize, and the company fired dozens, citing a lack of employment verification documents. The plight of the workers was taken up by a Milwaukee organization, Voces de la Frontera, and its founder, Christine Neumann-Ortiz, who has grown her advocacy group to the thousands. Voces is an organization that fights for the rights of immigrants, legal and illegal, in and out of the work place, says Milwaukee Magazine writer Kurt Chandler, who recently profiled Neumann-Ortiz. “Because many are non-English speaking, the center provides them with services on how to become acclimated and how to find their way into the system," Chandler says. Illegal immigrants are easily taken advantage of due to their citizenship status, he says. Companies have been able to pay under minimum wage while their employees are helpless to file formal complaints to governmental oversight. Labor abused workers then have to take to informal means of action. “They’ve been arguing, demonstrating, holding protests on behalf of undocumented workers and Mexicans who have been deported," Chandler says. The claims made by the Palermo’s workers were about dangers in the workplace and that overtime pay was hard to collect on. The workers went on strike, and said that Palermo's threatened them with an immigration audit. That's when Voces stepped in to offer help to the workers. A Milwaukee area writer, Chandler's article on Nuemann-Ortiz and the work done by Voces de la Frontera is in the July issue. Workers at the Caterpillar factory in South Milwaukee are closely watching a labor dispute at the company plant in Illinois. Caterpillar employees in Joliet have been on strike for three months. The company is seeking steep wage and pension concessions, and the union representing nearly 800 workers refuses to accept the demands. WUWM’s Erin Toner reports on speculation that the outcome of the dispute could be a bellwether for labor relations across the country. The Wisconsin AFL-CIO held a pro labor rally in Milwaukee on Wednesday. The event was part of a statewide tour that will end in Madison on Saturday, to mark the one-year anniversary of Governor Walker restricting collective bargaining rights for public workers. As WUWM’s Bob Bach reports, Wisconsin is at the forefront of retracting public union gains that opponents insist went too far, while the state was once a leader in creating worker protections. Nearly 50 Wisconsin legislators are urging Congress to reform the country’s immigration laws. Lake Effect's Mitch Teich interviews Esparanza Unida's General Manager Manny Perez. The future of immigration reform efforts in Congress remains in question two days after House Speaker John Boehner held a closed door meeting with leading Republicans.